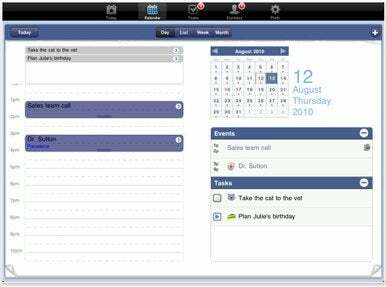 Iambic has brought its calendaring and time management application, Agendus, to the iPad. Agendus for iPad provides the same functionality and features as the Agendus iPhone app, but with new views and layouts tailored specifically for the iPad’s larger display. Agendus is designed to help you better manage your time and daily to-do lists by integrating your calendar, contacts, and task lists into a single interface. Agendus scans your contacts and populates them into its own contacts list, letting you easily add contacts to tasks and calendar events within the app. Agendus’s calendar improves upon the iPad’s standard calendar app by letting you easily view and add contacts, tasks, events, and birthdays without needing to switch to another app. It supports over-the-air syncing with Google Calendar, as well. Agendus also includes a task management tool that works in conjunction with your calendar and contacts list, helping you keep track of your tasks when on the go with your iPad. Other features include the ability to set calendar icons for certain tasks and events, view a list of upcoming birthdays, and get weather forecasts. Agendus for iPad costs $10 and runs on iOS 3.2 or later.